All concern are hereby informed that Stage-I recruitment examination for the post of Assistant Review Officer in pursuance to the Advertisement No. 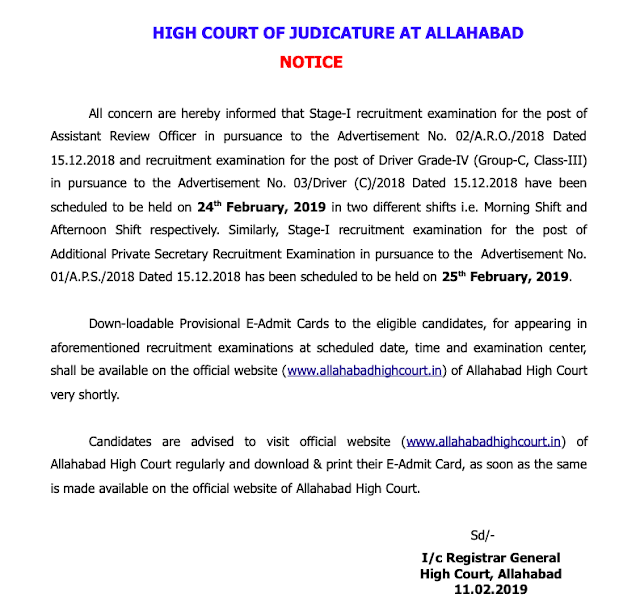 02/A.R.O./2018 Dated 15.12.2018 and recruitment examination for the post of Driver Grade-IV (Group-C, Class-III) in pursuance to the Advertisement No. 03/Driver (C)/2018 Dated 15.12.2018 have been scheduled to be held on 24th February, 2019 in two different shifts i.e. Morning Shift and Afternoon Shift respectively. Similarly, Stage-I recruitment examination for the post of Additional Private Secretary Recruitment Examination in pursuance to the Advertisement No. 01/A.P.S./2018 Dated 15.12.2018 has been scheduled to be held on 25th February, 2019.